The Old Guitarist was painted in 1903, just after the suicide death of Picasso's close friend, Casagemas. During this time, the artist was sympathetic to the plight of the downtrodden and painted many canvases depicting the miseries of the poor, the ill, and those cast out of society. He too knew what it was like to be impoverished, having been nearly penniless during all of 1902. 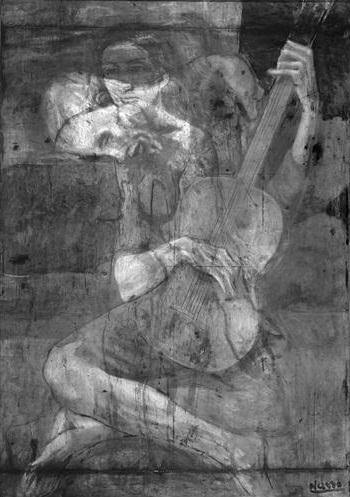 This work was created in Madrid, and the distorted style (note that the upper torso of the guitarist seems to be reclining, while the bottom half appears to be sitting cross-legged) is reminiscent of the works of El Greco. This bent and sightless man holds close to him a large, round guitar. Its brown body represents the painting's only shift in color. Both physically and symbolically, the instrument fills the space around the solitary figure, who seems oblivious to his blindness and poverty as he plays. At the time the painting was made, literature of the Symbolist movement included blind characters who possessed powers of inner vision. The thin, skeletonlike figure of the blind musician also has roots in art from Picasso's native country, Spain. The old man's elongated limbs and cramped, angular posture recall the figures of the great 16th-century artist El Greco. A perfect companion piece is Wallace Stevens's poem, "The Man with the Blue Guitar." The poet puts words to Picasso's belief that art is the lie to help us see the truth. Stevens writes: "They said, 'You have a blue guitar, / You do not play things as they are.' / The man replied, 'Things as they are / Are changed upon the blue guitar.'" As a metaphor for the need to immerse oneself fully in one's grief in order to heal, Denise Levertov's poem, Talking to Grief is also apropos. 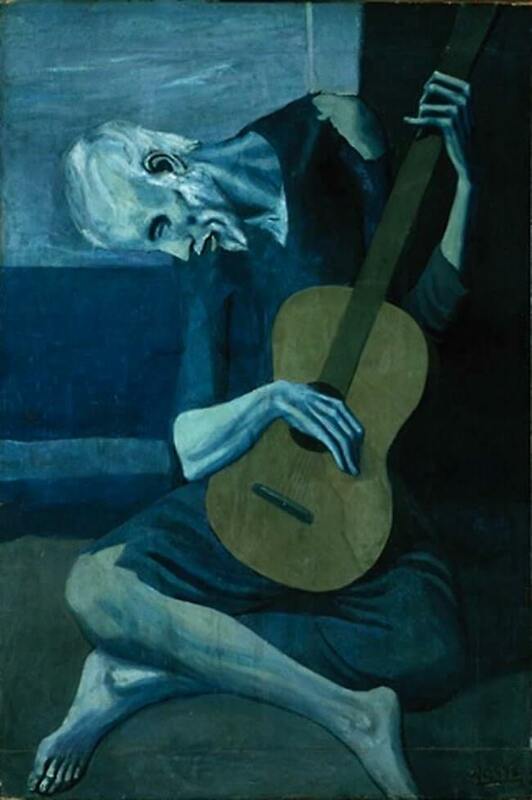 The Old Guitarist is probably the most iconic painting of Picasso's Blue Period when he was living in poverty and emotional turmoil. The painting is also notable for the ghostly presence of a mysterious image painted underneath. The technical examinations, combined with art-historical research, revealed two earlier compositions underneath the image of The Old Guitarist. This information gives us a better understanding of Picasso's artistic process. Research from the Art Institute of Chicago and a 2001 exhibit at the Cleveland Art Museum sought to decipher the under-painted images. The most obvious features include a woman's head looking left, an outstretched arm with an open hand to the right and shins which (especially in the x-ray image) appear to be in a seated position. It is very likely that Picasso originally started painting a portrait of a woman, who appears to possibly be seated, and in an upset or worried mood. Not much of this image is visible except for her face and legs. This painting is now located at Art Institute of Chicago in the Helen Birch Bartlett Memorial Collection.